The 21012C10 is a 12A DC to DC converter. The converter is used to provide energy for 12V apparatus from a 24V source. The converter provides both a switched output and an unswitched output. The switched output responds to the IGNITION input. When the IGNITION input is active the switched output is enabled. The feature is primarily used when the converter is used to power a radio with memory requirements. If a switched output is not required then the unswitched output should be used, and the ignition input and switched output pins can be left unconnected. 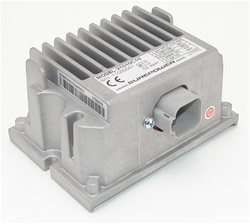 The converter is designed to withstand the severe electrical environment of heavy-duty trucks and off highway equipment. The converter can withstand load dump, reverse battery, short circuit, and over-temperature without damage to the unit. The switched output is implemented using a MOSFET transistor. Due to the MOSFET body diode the switched output should never be connected to a battery or voltage source. Protection circuits include an over voltage monitor for input voltage and over temperature monitor attached to the PCB near the internal FET’s. Both monitors can shut the converter off until the corresponding out of range condition is corrected. This is a well made converter that does exactly what I needed. Easy to mount and to hook up. It offers a few wiring options as well depending on your needs.